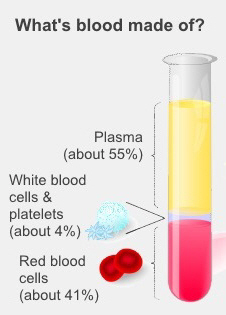 Your blood is made up of red blood cells, white blood cells, platelets and plasma. Checking your blood count, often called a complete blood count (CBC) or full blood count (FBC), looks at each of the different parts of your blood. Haemoglobin: this is found in your red blood cells. It carries the oxygen around your body. Haematocrit: this is the proportion of your blood made up of red blood cells. MCV: this stands for mean cell volume. It measures the size of your red blood cells. MCH: this stands for mean cell haematocrit. It is the average amount of haemoglobin in each red blood cell. Platelets: these form the part of your blood that helps to make clots if you cut yourself or are injured. WBC: this stands for white blood cells. It shows the total number of white blood cells in your blood. It adds all the different types of white blood cells in your blood. Neutrophils, lymphocytes, monocytes and eosinophils: these are all different types of white blood cells. They form part of your immune system, and each fights off different kinds of infections. There can be several reasons for your red blood cells being too high, including dehydration and smoking. You may need to have more tests to find the cause. If your white blood cells are too high, your body is probably fighting an infection. You might need to get this checked again later to make sure the levels have returned to normal. Platelet numbers can be high for several reasons. It can mean you are fighting an infection. Platelet numbers also rise after surgery. If your haemoglobin is too low it means you have anaemia. There are several possible causes for this, such as low iron levels, low vitamin levels or bleeding. You may need more tests to find out what is causing your anaemia. If your white blood cells are too low it may mean you have an infection, or your immune system might not be working properly. You may need more blood tests to find out why, and may possibly need a bone marrow biopsy. If your platelets are too low this can make you bruise or bleed more easily. There are lots of reasons this might happen, for example after an infection or because of medicines you are taking. You may need to have another blood test if your level is very low. If you have any questions about your complete blood count, talk to your GP.